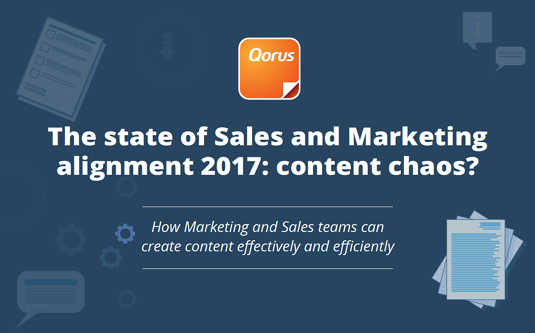 The state of Sales and Marketing alignment 2017: content chaos? Our research suggests that, while Sales and Marketing teams are more aligned than ever before, there is still a lot of frustration around how Sales content is created and managed. A lack of collaboration and poor content management practices lead to unnecessary inefficiencies and lost opportunities. This eBook features commentary from Jen Sieger, Director of Worldwide Inside Sales at Microsoft, Dunya Riechelson, President at Allytics, and Natalie Steck, Senior VP of Global Sales at Qorus.